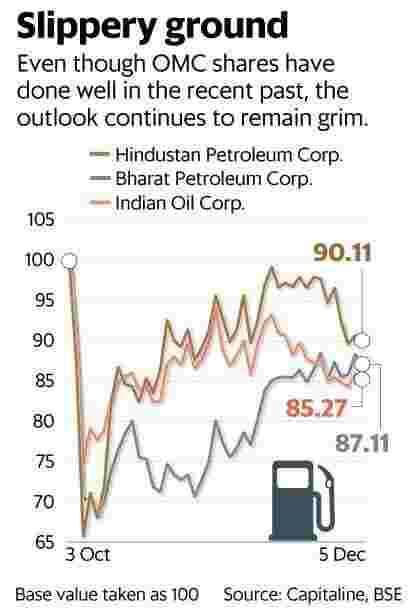 Sure, Indian Oil, BPCL and HPCL share prices have recuperated some of the losses seen in early October, thanks to the fall in crude oil prices. The stocks are now down 10-15%. Brent crude prices were $86 a barrel on 3 October and are now 28% lower. Lower crude oil prices raise possibilities for OMCs to recover some of their marketing margin losses. Motilal Oswal Securities Ltd said in a 26 November report that the fall in crude oil prices has enabled OMCs to boost their petrol/diesel marketing margins to ₹ 2.70/2.80 per litre in the December quarter so far. The measure for petrol/ diesel was ₹ 2/2.80 per litre in the September quarter. “Although there was no clarity as to when the OMCs would be able to raise their marketing margins," added the brokerage firm. Outlook for these stocks continues to remain grim. As analysts from Jefferies India Pvt. Ltd point out, with elections underway in five states, the general election due in 2019 and the government instructing OMCs to absorb lower margins, the margin gains may prove illusory especially if the fall in crude oil prices is transient. No wonder then, OMC stocks have only recovered partially from the October massacre. One must also remember that even before the October news flow, these stocks had underperformed the Sensex for at least a year. Meanwhile, under-recovery on cooking gas and kerosene sales for this fiscal year is expected to top the budget provision of about ₹ 21,000 crore. Assuming Brent crude at about $70 a barrel for the rest of FY19, analysts at Jefferies India estimate the under-recovery at about ₹ 39,000 crore. “With the fiscal space also narrowing elsewhere, we model upstream state-owned enterprises sharing the burden but the OMCs may too," the analysts wrote in a 14 November report. Simply put, the uncertainty surrounding the earnings predictability of these companies continues. In fact, large movements in crude oil prices in a short span of time, as witnessed in the recent past, make it all the more challenging for investors to forecast earnings of these companies. From a near-term perspective, the forthcoming meetings of the Organization of the Petroleum Exporting Countries (Opec) and friends should likely offer meaningful clues on the direction of oil prices. A decision to cut oil production would offer upward support to the prices. For now, the recent recovery in shares of OMCs can at best be treated as a temporary relief and definitely not as a factor to drive a re-rating of these shares.